There are at least half a dozen lolos all under the same roof area. On first glance, it looks like there is one, maybe two restaurants, however each change in table color indicates another restaurant! Some only have six tables to their name, but don’t let that stop you from checking them out. Here is where you can find a great selection of food, served with a million sides, all for less than $15. The main strip of Grand Case, St. Martin is a slightly winding, one way road which trades the shoreline from behind the waterfront stores and restaurants. On the north side of town, there is a public parking lot. Park there and hop out, to explore on foot. The lolos are only a block or so up the street. From the street side, you can see two, but the most predominant sign is the faded blue of “Sky’s the Limit.” As you approach, the different proprietors might be vying for your business, ushering you into their little slice of BBQ heaven. Sky’s the Limit offers more tables than most, tucked in along the street. They also appear to do a rather brisk take out business with the locals. As you walk through the lolos, toward the beach, you can see all of their grills, warming plates and chock-a-block full meat smokers. The prices seem to get lower as you get closer to the water, so look through the menus before you succumb to the sales pitches. Each of the restaurants serves a slightly different selection, though the basics are the same. For $8-14, you can get a main plate of food, served with four to six sides. The sides usually include coleslaw, spaghetti, mac and cheese, pasta salad, garden salad, rice and beans, rice and beans and diced vegetable salads. The side servings of meat are quite generous and run $4-7. 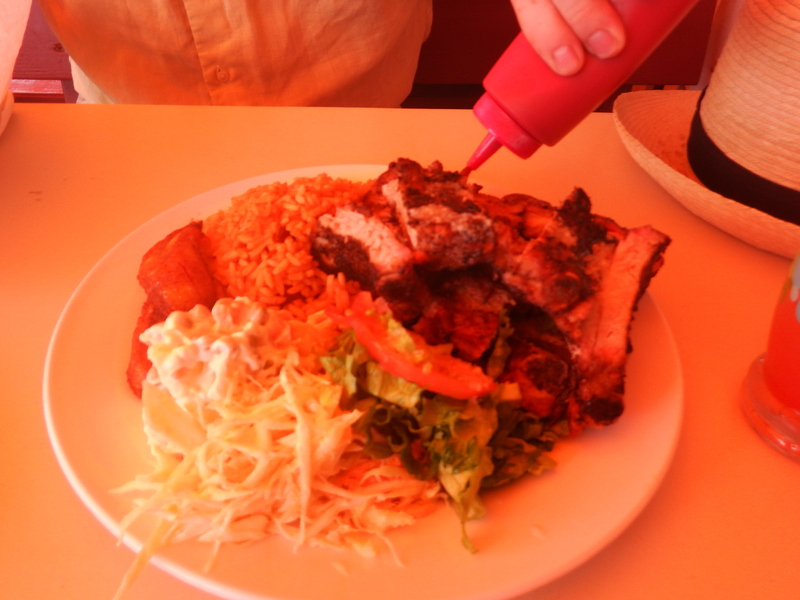 For two people, a side order of ribs or chicken, coupled with one main dish that includes sides, will be plenty of food. If you play your cards right, you can have a full meal, with two drinks, for $16 USD. The lolos, in general, accept USD and euros at a one to one exchange rate, so make sure you have USD to pay your bill! Despite being an island nation, the land-based BBQ food tastes amazing and serves up a better value and taste at the lolos. Also try out a Johnny Cake, a Caribbean staple food. Either baked or fried, they are a biscuit shaped yeast bread, similar to focaccia in density. Crab backs are also a regional specialty, a bread crumb and crab meat mixture stuffed into the back of a small crab and baked in the shell. Yum! They run $4-6 at the lolos. For the best value and taste, check out the lolos of Grand Case in St. Martin to satisfy your hunger cravings. You can drink a $1.50 beer, tuck into some deliciously smoky ribs ,and gaze out at the turquoise waters of the Caribbean – all for less than $10! Thanks for the tips. My husband and I are excited about our first trip to St. Martin in August! Awesome! Have a great time!!! I highly recommend eating at the Lolos! They are an absolutely fantastic value (and most of the restaurants we tried while in SXM were definitely not!). I’m going there in about two weeks. How safe is it? I will have my camera, camera gear and tripod to take pictures. In St. Martin in general we felt very safe. We stayed in Grand Case and I felt completely safe during the day in all areas. At night near the French restaurants I felt a bit less so, but that was mainly because we had to park in the more residential area a bit away from the main area and it was pretty dark. My husband was not worried at all and we had no problems, but I definitely felt uneasy until we got to our destination.